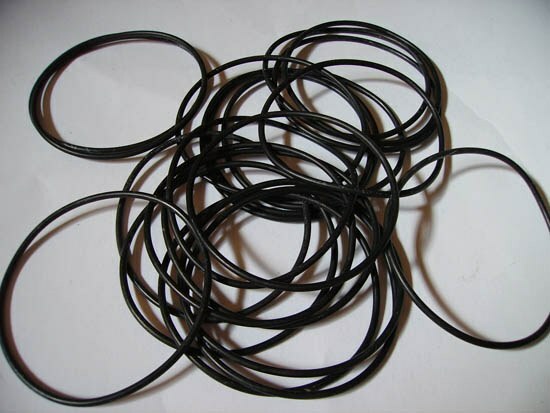 Natural rubber is a technical product, which are made from different elastic materials. But sometimes from time to time or low temperatures they become stiff. There are some ways in which you can soften products made of rubber. Of rubberand make tires, shoes, shocks, belts, rubberized fabric and a lot of various parts for automotive and household appliances. If they're worn out, try to return them elasticity by using kerosene. It is a proven and the most commonly used method. Pour some kerosene in an enamel bowl, put rubber part and let it lie there for 2-3 hours. Then carefully wash it in detergent and wipe dry. After that, the rubber will become soft and elastic. Can also use ammonia. Dilute it in the ratio of one to one with water and immerse in a solution of the desired rubber part for 20-30 minutes. After that, rinse with clean water, Pat dry and can use. It happens that the softening of rubber required for a short time, for example, to pull the hose on the metal pipe with equal diameter. To do this, just put the hose end in boiling water, soak a few minutes and pull on the pipe. The boiling water will make the rubber soft, and the hose easily fits over the metal. Rough parts need to relieve can be softened with hot air. Turn the Hairdryer on full power and aim the jet at the detail. After 4-5 minutes, try to turn the item and yank it open. Try to boil the old tires in the salt solution. Take a liter of water, add two tablespoons of salt and boil this solution the product within 10 minutes. Also lubricate the rubber parts with silicone. He has for some time restores their elasticity. Apply the silicone to the part, give a little lie down, and then use. In the same way treat the item with castor oil. A short-term softener rubber. So repeat the procedure as often as possible. Today for maintenance of office equipment produced a special spray softener of rubber. It restores the softness of the rubber rollers in printers and copiers. Buy this spray in specialized stores and use when restoring rubber parts.